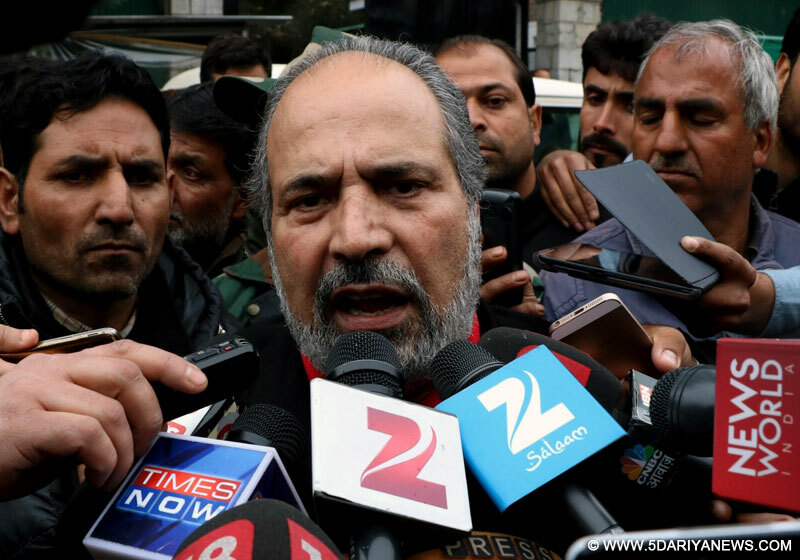 Member of Parliament (MP) and senior PDP leader, Muzaffar Hussain Beig on Wednesday said that the Prime Minister Narendra Modi should personally intervene into the issues related to Kashmir and restore normalcy in the Valley.Speaking in the seminar titled, “Way forward in Kashmir” held in Delhi, Beig said that the youth cutting across the barriers of villages, territories and cities are taking part in protests while the current protests looks like unprecedented.He accused Pakistan of sponsoring the current unrest in Kashmir.“But Pakistan is interfering in current situation in Kashmir while Hafiz Sayeed who carried out procession over it indicates that Pakistan is also sponsoring current situation of Kashmir,” he said. He said that it is true that Kashmir cannot be separated from India at any cost but Prime Minister and his other ministers should personally intervene into the issues related to Kashmir. “Whatever PM has promised to the people of Kashmir, he should fulfill those at earliest. Fulfilling promises at this time cannot solve the issue but priority at this time to restore the peace,” he said. CPI (M) leader and MLA Kulgam, M Y Tarigami while addressing in the seminar said that the government of India has failed to fulfil the promises made with the people of Kashmir. “Until the GoI will not accept the people of Kashmir, it is impossible to stop such kind of situations across the Valley,” he said.He said that at this point of time “we are irrelevant as nobody listen to us.”Democratic Party Nationalist (DPN) president and former agriculture minister, Ghulam Hassan Mir said that youth of Kashmir have not been empowered in any manner that is the only reason they choose militancy and which led to the excessive use of force due to which 50 people killed while thousands were injured and even infants including boy and girl were blind.Terming the current situation as serious, Mir said that it is unfortunate that the government is yet to take the issue seriously. “Until the discrimination against Kashmiris won’t end and their issue will not be addresses, the peace here is impossible,” he said.NCPs Rajiya Sabha member, Majid Memon said that the government should give first priority to restore peace in the state and to stop the excessive use of forces here.“Excessive use of forces which led to the killing and injuring of youth should be thoroughly investigated,” he said. Legal eagle and Chairman Kashmir Policy & Strategy group Ashok Bhan has urged the PM Modi,to urgently intervene in the affairs of Kashmir and convene an all party meet and send a parliamentary delegation Kashmir to address and set right the unrest, the continued hardship and violence being suffered by the common people,Bringing about the peace in the Valley should be the first and foremost concern of the entire political spectrum across the Country.Speaking at a seminar on" Way forward in Kashmir" in Delhi,Ashok Bhan,said;-Paying attention to Kashmir by PM Modi himself and his team will be politically beneficial and in the People"s interest. Dialogue with all the stake holders,the agitating Youth and the civil society becomes important.This is the same Youth whose participation in the elections made a huge difference as such are the most important component of the political process. The educated youth going towards militancy in large numbers is a serious cause of concern. Kashmir has been on burn for more than 27years. Tens of thousands of people, from young to soldiers lost their lives and population of Kashmiri Pandits exiled. It is the time for a holistic political process to kick in, drawing from past efforts and adopting best practices from around the world on resolving such unrest. New Delhi needs to approach the issues keeping in sight the fact that India"s strategic interests are intertwined with the good will of the" Valley"s ordinary People and not the land alone..